Baia dos Golfinhos Beach, Fernando de Noronha, Brazil. Baia dos Golfinhos is home to some of the well known species of dolphins. Baia do Golfinhos bay has several names. It is called the Golfinhos bay or Carreiro de Pedra creek or stone creek Carreiro beach. All these names imply that it is home to dolphins. This is one place you just cannot miss. Baia do Golfinhos is a mating and resting place for some of the well known species of dolphins. 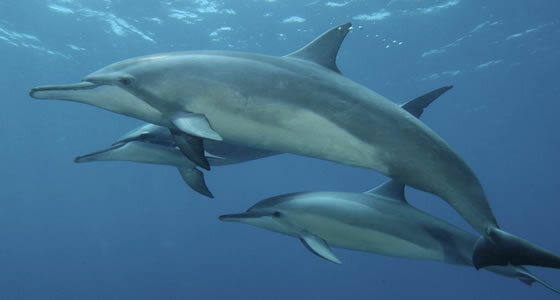 The bay comes under the jurisdiction of national marine park and is a highly protected area to preserve the dolphins and their territories. Access to this bay by sea is prohibited and the only way is to follow a trail leading to a 70m high cliff but it’s worth the hike. This cliff is the lookout point for all the dolphin activity and you can catch them live in action. Baia do Golfinhos is home to the golfinhos rotadores or simply called the spinner dolphins. At the first glimpse of dawn these dolphins are known to indulge in some great and enthusiastic acrobats turning the bay into a sporting arena. To watch this spectacular view, you need to be there as early as 6 am. Later into the day during a boat ride you may get to see the dolphins just spinning and diving or feeding their young ones. Golfinhos bay is a sanctuary you just cannot afford to miss.